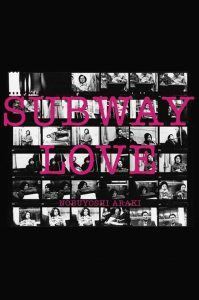 For a period of almost ten years, from 1963 until 1972, the young Nobuyoshi Araki obsessively photographed fellow passengers during his daily trips to and from work on the Tokyo subway. Yawning businessmen, dozing women, children who guessed what he was up to and mugged for the camera – Araki captured them all on film. His candid black and white portraits, shot without using the viewfinder, record Tokyoites of the ’60s and ’70s in all their vitality and variety.